To the Ends of the Earth – Or so it seemed. One of our first stops was in Cedar Breaks Monument (a “monument” in this context is a land preservation designation created by Presidential proclamation). 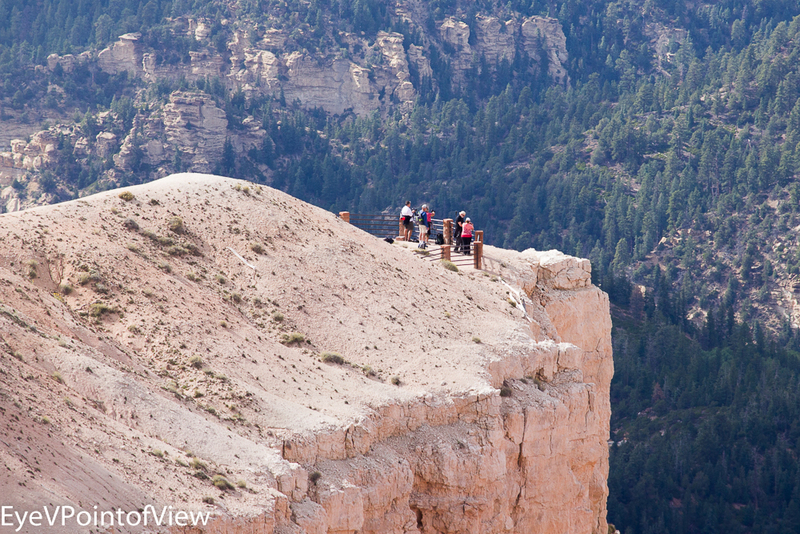 Some of our group walked to the canyon overlook. It was my first day out in this hot, high altitude climate, I couldn’t make the trek to the canyon overlook. From my perch on the hillside, my colleagues almost seemed like specks on the land. Exploring the Hoodoos of Bryce Canyon National Park – Hoodoos are rock structures emerging from the rocky mountainside, created by weather and wind erosion. They are fascinating to see, because many times, they shapes formed are almost realistic – you might see structures that look like figures, inanimate objects (Thor’s Hammer), arched doorways, animals, and faces/heads. 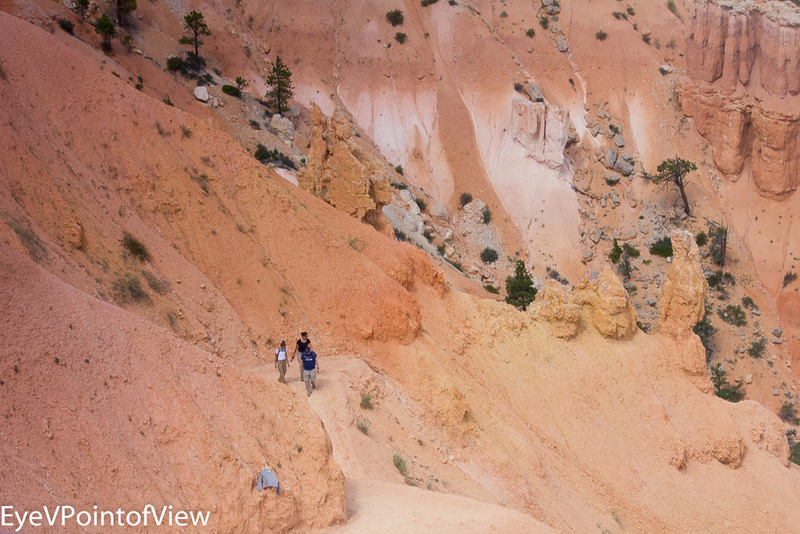 In this image, you can see the relative size, when compared to the hoodoos. Facing the Shadows – I admit it. The shadows here are the photographers in our group – see our tripods? 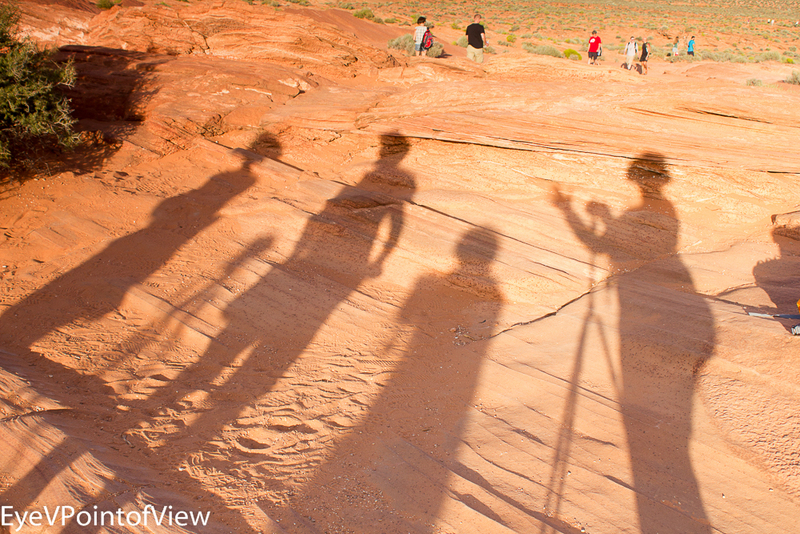 While atop the canyon overlooking Horseshoe Bend (where the Colorado River flows from Lake Powell AZ), I turned around and spied the elongated shadows on the rocks. I love shadows – I couldn’t resist it – snap! Over the Top – The cliff overlooking Horseshoe Bend is 1000 feet from the ground, and as you can see in these images, has no guard rail. 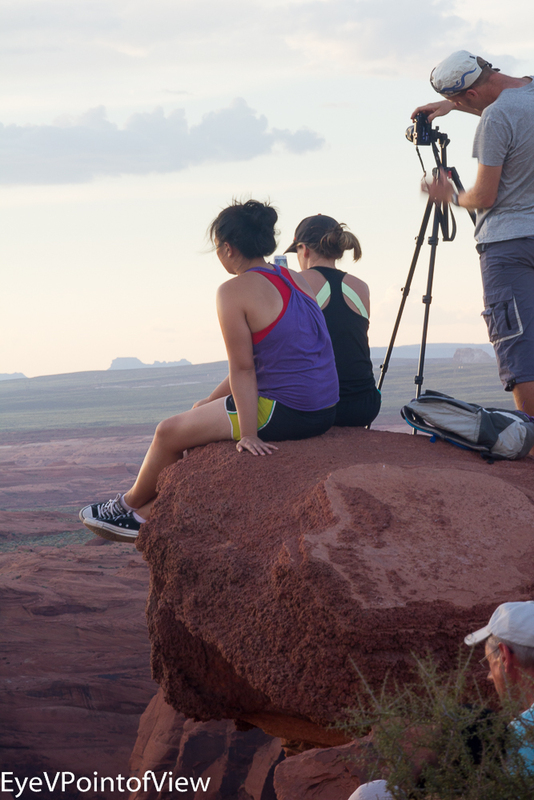 These two females sit comfortably (presumably), with their feet dangling over the edge, and there is a photographer nearby setting up his tripod. They all were much too close to the edge of this high drop than I would prefer. And these few were not the only ones! 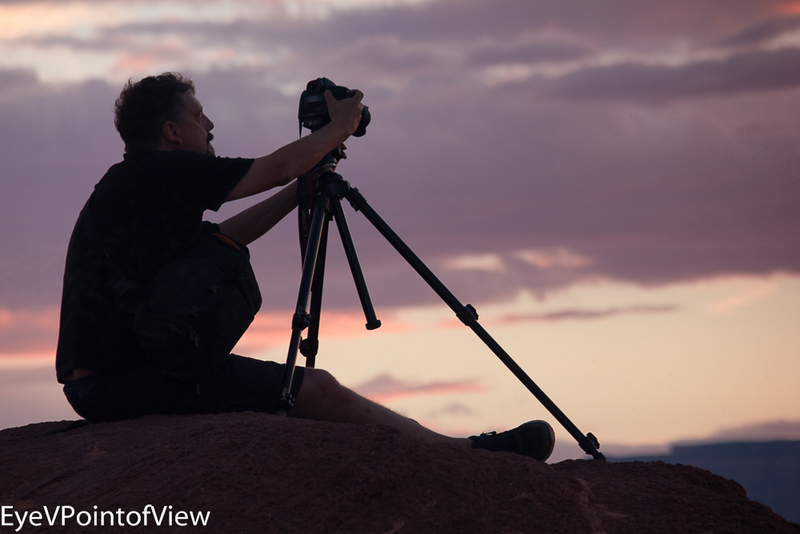 Sunset at Horseshoe Bend – See? Like I said, they were all more comfortable setting up near the edge than I. Moving on: Virgin River Walk – our next stop was the Virgin River in Zion National Park. This shallow river at the base of the canyons offers some beautiful vantage points for photography. It is also a popular walk for individuals and groups. 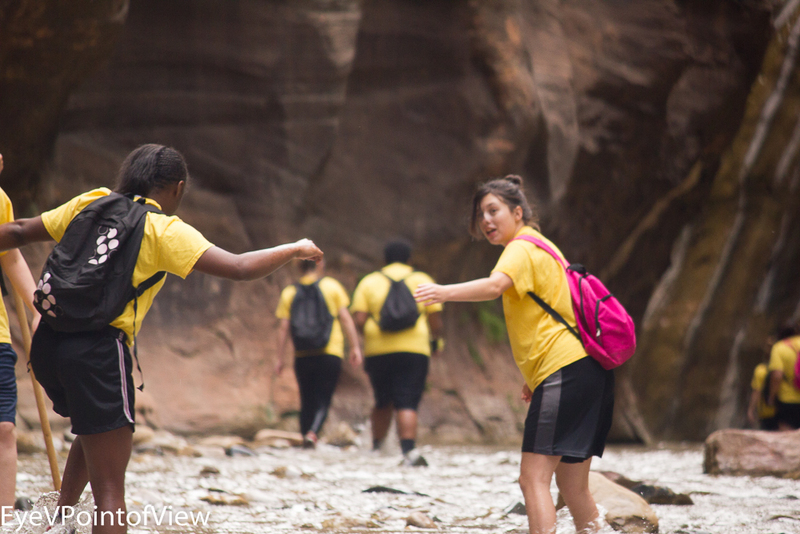 This group of teenaged girls giggled their way through the walk, their laughter bouncing off the canyon walls. This image was taken early in the walk – I loved the seeing one teen stop, turn around and extend her hand to the other. Speaking of Hands – On one of my frequent stops, I sat on a rock and based in the brief peacefulness of the spot, looking first low, then higher. The rock was a way point, though, and other hikers frequently passed through. At one point, I happened to look up, and saw the woman in front of me. For some reason, her hands captivated me – snap! 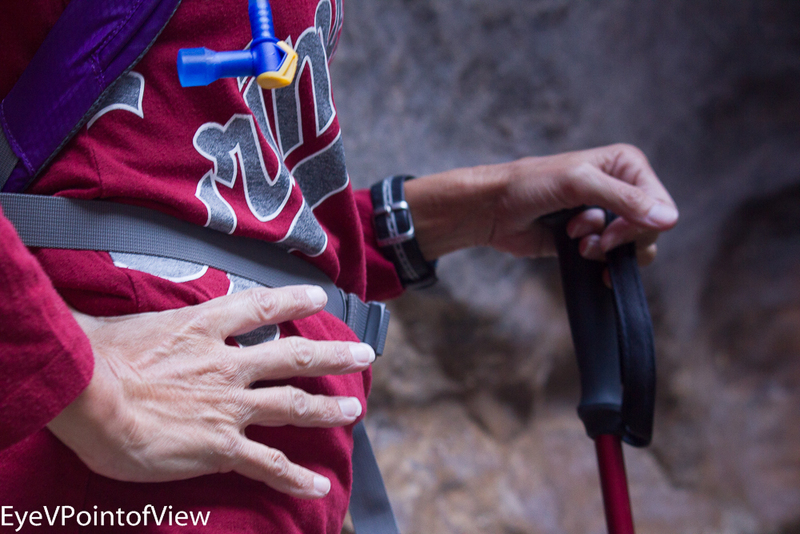 I got the image of those capable hands of this experienced hiker before she walked away. Well so much for the people watching. Time to go back to screening those 2500 other pix I have, not all of which are 5*! Hope you enjoy these. Ok. These nuts sitting on the edge are scaring me!!!! God Bless Them for being so bold. Don’t think I could / would have done it. LOL. KD, they scared me too! Thanx for reviewing and commenting!